Inspection Services LLC offers the most comprehensive home inspection available. With every home inspection we start at the roof and evaluate not only the roof surface, but also the chimney, the ventilation system, the electrical service entrance, the plumbing stack, and any other systems or components located on the roof. Our next step to the home inspection is to inspect the exterior of the home. We use a macro and micro approach to look at both the big picture and all the details.of the home inspection. We then move the home inspection inside the house, and starting at the bottom, work our way up through the home into the attic. While inside, we inspect such things as the structure, the heating and cooling systems, the electrical and plumbing systems, the interior finishes, the insulation and ventilation, and accessories such as fireplaces. Our evaluation of the home inspection is then communicated through a detailed home inspection report, which includes descriptions of all the systems in the home, as well as any recommended improvements. This will help you prioritize the improvements and develop a blueprint for your future in the home. 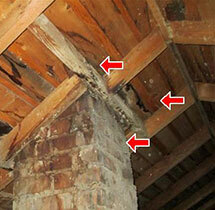 Best of all, our home inspection services don’t end with the home inspection. For as long as you own the home, you can call with any additional questions – at no extra charge!